The European style ("taller than wide" opening) of the Everest offers a fresh new look that's sure to add charm to any home. 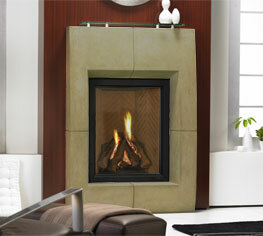 Its unique stacked campfire log set and distinctive refractory turns any room into a showpiece. It also features a clean face design that allows for a true masonry appearance. And, because it's a direct vent, it's easy to install and maintains your indoor air quality.